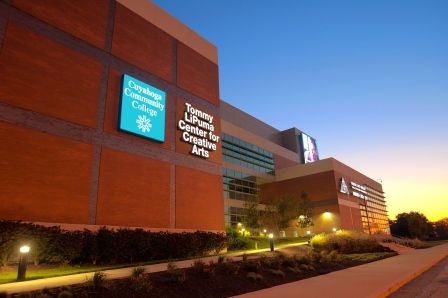 The Gill and Tommy LiPuma Center for Creative Arts at the Tri-C Metropolitan Campus provides a unique learning environment for students pursuing studies in a wide spectrum of creative arts disciplines. A joint project between the college and The Rock and Roll Hall of Fame and Museum, the center features 75,000 square feet that bring together many of the college’s media arts, recording arts, performing arts, animation laboratories, and other programs. The center also houses dance and theater studios, audio and keyboard classrooms, music technology labs and editing suites. It also houses The Rock and Roll Hall of Fame and Museum’s library and archives. The Center is named in honor of Cleveland native Tommy LiPuma, one of the most successful pop and jazz producers of all time with 33 gold and platinum records to his credit, 33 Grammy nominations, and three Grammy awards. He has produced for legendary artists like Miles Davis, Sir Paul McCartney, Natalie Cole, Barbra Streisand, George Benson, Al Jarreau, Diana Krall and David Sanborn to name a few. Mr. LiPuma made a $3 million endowment to Tri-C, the largest private gift contribution in the school’s history, to support the school’s progressive movement for having the latest technological advances in creative arts, including music, film, and animation. Tours of the Gill and Tommy LiPuma Center for Creative Arts are available monthly. They are led by David Kennedy, Program Manager of the Recording Arts and Technology Department, on the second Wednesday of each month. Tours meet in the lobby of the Center for Creative Arts at 2 p.m. and take approximately 45 minutes to complete. Parking is available at meters in front of the building or in the visitor parking section of Lot 5 underneath the building.